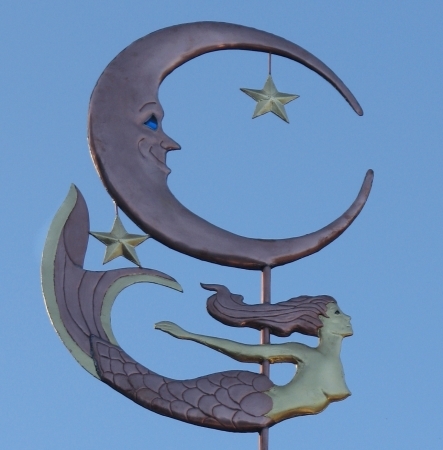 Our Mermaid Weather Vane with Moon can be constructed in all copper or a combination of copper and brass. 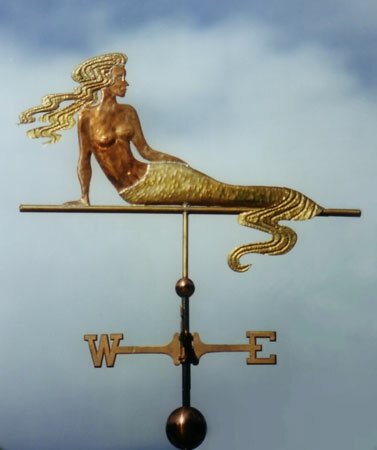 In the weathervane pictured, we added a number of optional gold leafed accents to create a striking contrast between the weathered copper and luminous gold leaf. 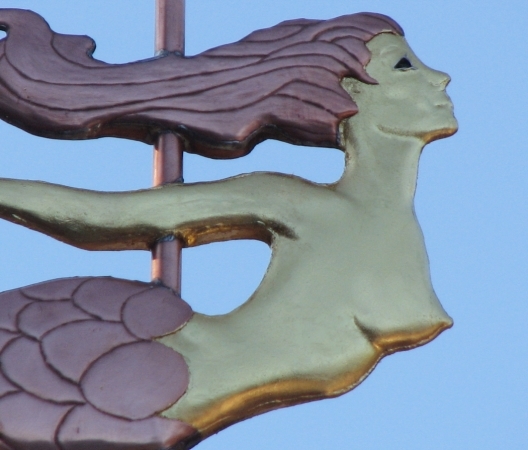 Mermaid weather vanes are popular designs, especially for homes along the coast or on cabanas next to swimming pools. 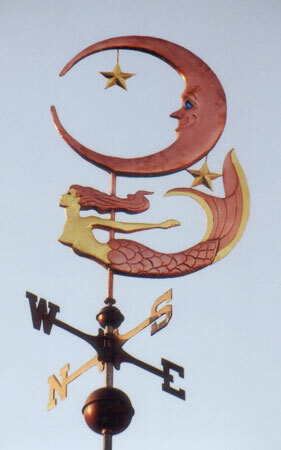 This design was commissioned in 2011 by a customer in Southern California who had admired her neighbor’s weather vane for 15 years. At long last she asked where they had purchased it, found out it was from us, and then called and ordered this design of a Mermaid with Moon. 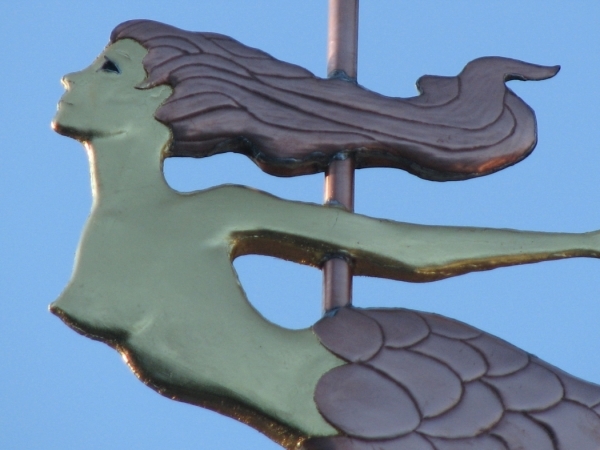 For her husband’s Father’s Day gift she had purchased a flagpole to be installed on their dock in the marina and wanted a special weather vane to put on top of it. 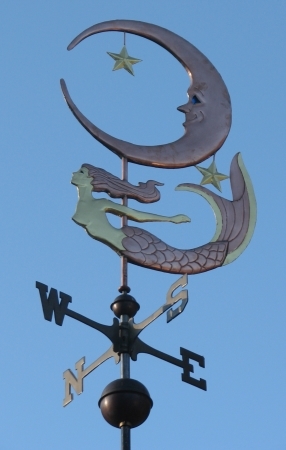 The nautical location seemed well suited for a mermaid weather vane. 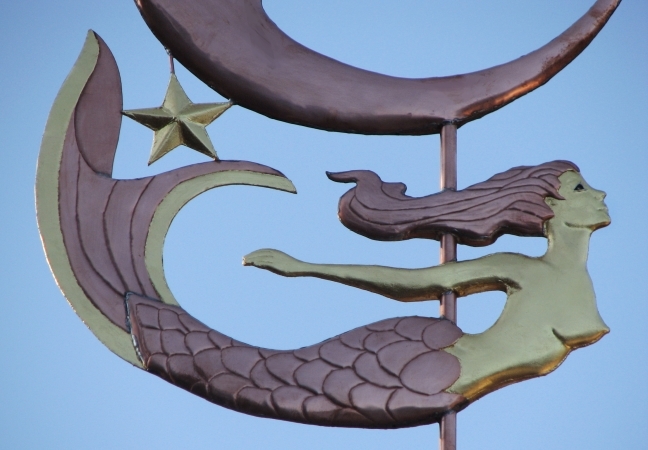 The moon shown here has translucent aqua glass eyes and the mermaid has translucent green eyes. We included nine “lucky” pennies inside the weather vane, each penny based on the year a family member was born, and one for the year the weathervane was made. There is a century-old tradition in weathervane making where the craftsman places a copper penny from the year the weather vane was made inside the sculpture piece for good luck. 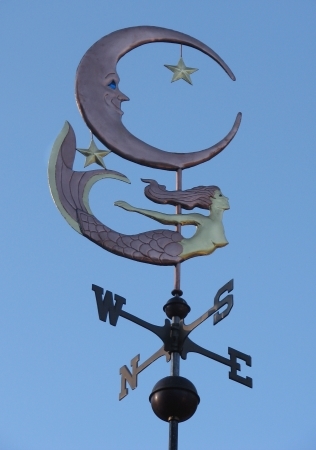 Because we make each weather vane to individual order, we offer our customers the opportunity to put special pennies inside their weather vanes based on important years in their lives. 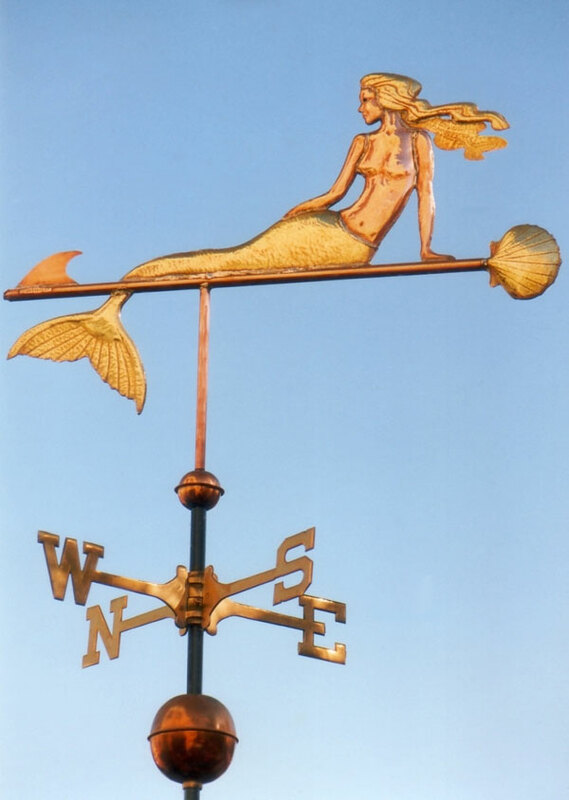 When a customer orders a weathervane from West Coast Weathervanes, they may select the metal combination, eye color if applicable, ‘lucky’ pennies and optional gold leafing. Our customers can pick and choose among these selections or adapt a design to arrive at the combination that works best for them. 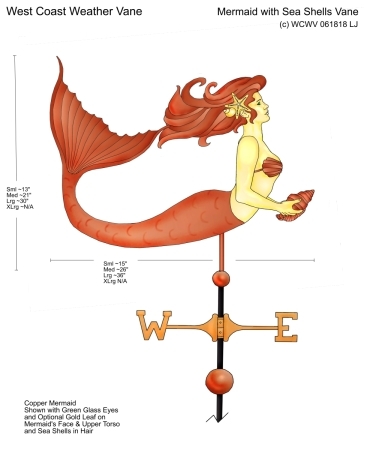 We have several mermaid weathervane designs available or we would be happy to assist you in creating a new variation on these designs.